Hi there, I am Chuck. You may see me at the dentist office here in Bend Oregon. Can you guess what kind of dog I am? The key to a great relationship with your dentist is one of trust and honesty. The right dentist is essential for keeping healthy teeth and gums. At West River Dental in Bend, you will find a warm and caring environment. We invite your family to experience the pride in the care we take with all our patients, young and old. Offering the highest quality care with in the least invasive way is our goal at West River Dental. Our services include: dental exams, teeth cleaning, fillings, crowns, bridges, implants, and cosmetic services such as teeth whitening and Invisalign©. One of the most stressful parts of going to the dentist just got a lot easier (and much less painful!). "The Wand" offers a painless alternative to the typical dental syringe. It delivers the right amount of anesthesia to the patient every time. Most patients report a pain free experience. Modern high-quality dental digital imaging is now available. Superior to traditional X-Rays found at most dentists, 3D imaging allows us to screen-for and detect issues farther in advance than traditional methods. Contact West River Dental and make an appointment today. 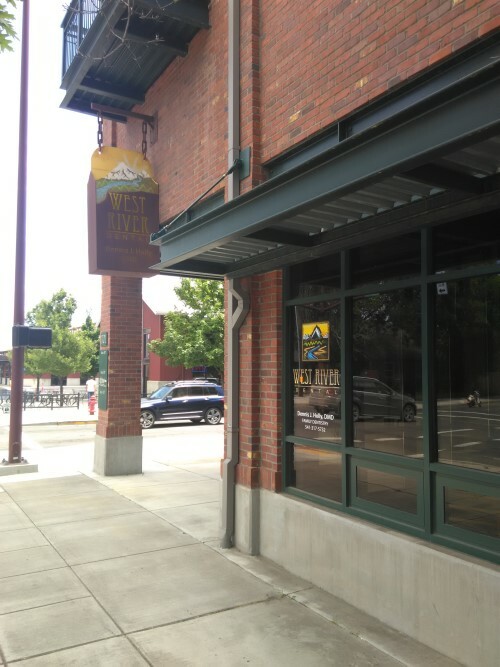 We are located in the Mill Quarter section of Bend, Oregon. Centrally located for convenience from any part of town. Privacy Terms. ©2019. Dr. Dennis Holly. West River Dental, Bend Oregon. All Rights Reserved. WebSite by Bend Internet Solutions.